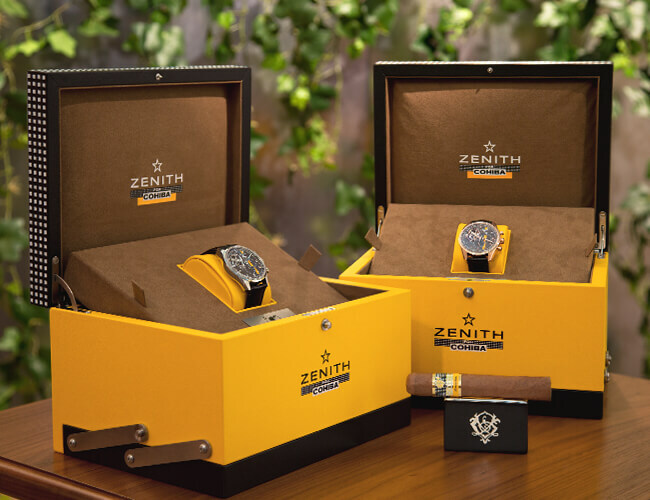 The latest edition symbolizing the union of two historic brands, The El Primero Chrono master 1969 Cohiba Edition, symbolizes the joining of the two legends: the 101 years of watchmaking know-how combined with a legendary Cuban cigar brand. Limited to 50 pieces in pink gold and 500 for the steel version, this novelty celebrates Cohiba’s 50th anniversary. The Chronograph’s 42mm diameter cases house the El Primero mechanism designed and perfected by Zenith. The automatic self-winding mechanism is COS certified with 50 hours of power reserve. The dial is equipped with two sub dial readouts on the 3 and 6-hour marks and a beautiful skeletal cut-out on around the 11th hour allows us to see the legendary El Primero mechanism in action. Both editions of the watch share the tabacco-coloured tachymeter dial, with Cohiba’s famous checkered black and white pattern and yellow gold stripe. The watch also has Cohibas’ Taino Indian applied on the dial to complete the ensemble.